What is Gastroparesis? Also called Gastroparalysis, gastroparesis is caused by paralyzed stomach muscles due to damage to the vagus nerve or brain and causes delayed gastric emptying. The root word gastro means stomach and paresis stands for paralyzation so the definition of gastroparesis quite literally means stomach paralyzation. 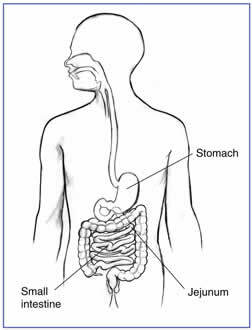 Gastroparalysis is defined as delayed gastric emptying due to the amount of time it takes for food to travel down the digestive tract as a result of stomach muscle paralyzation caused by damage to the vagus nerve or brain. The brain sends electrical impulses to the vagus nerve, which in turn tells the stomach muscles to contract and move food along the digestive tract. Damage to the brain or vagus nerve due to brain damage or diabetes can paralyze your stomach muscles, causing delayed gastric emptying by preventing electrical impulses from getting to the vagus nerve or stomach muscles. Gastroparesis causes the contents of the stomach not to move down the digestive tract like it should, causing the contents of the stomach to break down in the wrong intestine which causes it to ferment. Although gastroparesis is not curable there are some treatments. The easiest treatment is eating a gastroparesis friendly diet, or foods that do not back up the digestive tract and are easy to digest. Check out our site menu for more information on recommended foods to eat for gastroparesis, as well as diabetic gastroparesis. gastroparalysis.com © 2019, all rights reserved.